79 posts categorized "The Metaweb"
I'm sitting the Dynasty Lounge in Taipei, enroute to Singpore where I will be addressing ministers of the government there on the potential of the Semantic Web. Singapore is a very forward-looking country and they have some very exciting new initiatives in the works there. After that I hope to have a little time for a vacation and then I'm heading back to San Francisco, returning on August 1. I should have email for all or most of the time here, so that is the best way to reach me directly. And of course you can comment on this blog too. As for the company -- lots of good news here at Radar Networks. First of all the team has gotten the next version of our alpha up (our hosted Web service for the Semantic Web) and it's getting awesome! We're on track for a invite only launch in the fall timeframe as planned. We also chose a brand for our product, with help from the mad geniuses at Igor International. The new brand is secret until launch but we love it. We'll be announcing the brand close to launch. If you want to be invited to our launch and be one of the first to see how useful the Semantic Web really can be -- sign up for our mailing list at http://www.radarnetworks.com/ -- and feel free to invite your friends to sign up too. Only people who sign up will get on our waiting list. We already have around 2000 bloggers and other influencers pre-registered, and more are coming every day, so don't wait -- it will be on a first-come, first-serve basis. We'll be letting people into the service in waves. Another exciting development: Several of the world's big media empires have started approaching me to see how they can get involved in the network we are building here at Radar Networks. They are interested in the potential of the Semantic Web for adding new capabilities to their content and new services for their audiences. That's an exciting direction to explore for us. 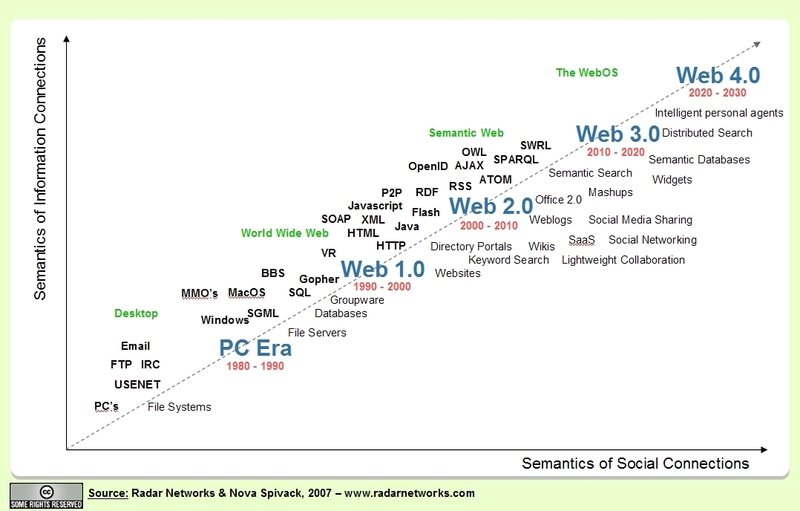 If you have large collections of interesting, useful, content of value to particular audiences, or if you have large audiences that need a better way to do stuff on the Web, feel free to drop me a line and we can discuss how you might be able to get involved with the Semantic Web in partnership with us. In other news, I am still inundated with hundreds of emails from interesting people who read the articles about us in this month's Business 2.0 and BusinessWeek. It's been very interesting to connect with so many other thinkers and businesses. Forgive me in advance if takes me a while to write back -- I promise I will. I can't wait to come back to San Francisco and start playing with our alpha -- it's really getting there. All the credit should go to our awesome development team. They've been writing tons of code and it's starting to really pay off. Sorry I didn't post much today. I pulled an all-nighter last night working on Web-mining algorithms and today we had back to back meetings all day. I just came back from a really good product team meeting facilitaed by Chris Jones on our product messaging. It's really getting simple, direct, clear and tangible. Very positive. It all makes sense. It's pretty exciting around here these days -- a lot of pieces we have been working on for months and even years are falling into place and there's a whole-is-greater-than-the-sum-of-it's-parts effect kicking in. The vision is starting to become real -- we really are making a new dimension of the Web, and it's not just an idea, it's something that actually works and we're playing with it in the lab. It's visual, tangible, and useful. Another cool thing today was a presentation by Peter Royal, about the work he and Bob McWhirter have done architecting our distributed grid. For those of you who don't know, part of our system is a homegrown distributed grid server architecture for massive-scale semantic search. It's not the end-product, but it's something we need for our product. It's kind of our equivalent of Google's backend -- only semantically aware. Like Google, our distributed server architecture is designed to scale efficiently to large numbers of nodes and huge query loads. What's hard, and what's new about what we have done, is that we've accomplished this for much more complex data than the simple flat files that Google indexes. In a way you could say that what this enables is the database equivalent of what Google has done for files. All of us in the presentation were struck by how elegantly designed the architecture is. I couldn't help grinning a few times in the meeting because there is just so much technology there -- I'm really impressed by what the team has built. This is deep tech at its best. And it's pretty cool that a small company like ours can actually build the kind of system that can hold it's own against the backends of the major players out there. We're talking hundreds of thousands of lines of Java code. It's really impressive to see how much my team has built. It just goes to show that a small team of really brilliant engineers can run circles around much larger teams. And to think, just a few years ago there were only three of us with nothing but a dream. Today our product team met with Shel Isreal to show him the alpha version of what we are building here at Radar Networks and get his feedback. Shel had a lot of good insights. We showed him our full product and explained the vision, and gave him a tour of the new dimension of the Web that we are building. We also showed him how content providers such as bloggers and other site creators, and content consumers, can benefit by joining this system. Then we asked him how he would describe it. Shel suggested that one way to express the benefit of our product is that it helps content creators, like bloggers, become part of more conversations. "Conversation" is a key word for Shel, as many of you know. He views the Web as a network of conversations, not just a network of content. In a sense, content is a means to an end -- conversation -- rather than an end in itself. So from that perspective we are advancing the state-of-the-art in conversations (broadly speaking, not just in the sense of discussions, but in the sense of connecting people and information together in smarter ways). That's an interesting take on what we are doing that I hadn't really thought about. Shel also suggested that even though we are still a ways from being ready to launch the beta, he thought what we had was "so much better than anything he has seen" that we should start talking about it more -- without getting into the actual details of how we are doing it (gotta save something for later, after all!). I'll explain more in future posts. My company, Radar Networks, is building a very large dataset by crawling and mining the Web. We then apply a range of new algorithms to the data (part of our secret sauce) to generate some very interesting and useful new information about the Web. We are looking for a few experienced search engineers to join our team -- specifically people with hands-on experience designing and building large-scale, high-performance Web crawling and text-mining systems. If you are interested, or you know anyone who is interested or might be qualified for this, please send them our way. This is your chance to help architect and build a really large and potentially important new system. You can read more specifics abour our open jobs here. I'm very pleased to announce that two distinguished Silicon Valley veterans, Lew Tucker Ph.D. and Mike Clary, have joined Radar Networks (http://www.radarnetworks.com). In addition, we have just launched a new version of the Radar Networks corporate website with these details and more. It's been a great few weeks at Radar: As well as Lew and Mike, we've made a number of great new hires at other levels of the company, including several new senior engineers, a search architect, an additional UI designer, and our first office manager. On top of that we've come up with several very interesting new algorithms related to what we are doing over the last few weeks and our alpha is making solid progress. We're now around 15 people and growing and it really feels like the company has shifted into a new stage of growth. And we're having a lot of fun! Open IRIS - Semantic Desktop PIM Released! Yesterday, the first public open-source release of Open IRIS was annnounced. IRIS is a Java-based desktop semantic personal information manager developed by SRI (with help from my own company, Radar Networks -- we provided a some of our early semantic object libraries and a native triplestore, and some work on UI; note that our own upcoming products, and our semantic applications platform, are quite different from IRIS and focused on different needs, however), as part of the DARPA CALO program. IRIS provides a rich semantic web based environment for desktop personal knowledge management across activities, applications and types of information. This release is primarily for semantic web and AI researchers for now -- in other words, it's still early-stage software (not intended for end-user consumers...yet) -- but for researchers IRIS provides what may be the most comprehensive, robust development platform for building next-generation learning applications that help people work with their desktop information more productively. If you're interested in a practical example of how the semantic web looks and feels on the desktop, see the information on the Open IRIS site, or if you're a bit more of a geek, download it and try it yourself. Congratulations to the IRIS team at SRI on this release! George Dyson wrote a nice piece on his impressions from a visit to Google, and some speculations about the future of AI on the Net. There is a hidden problem with open databases such as Google Base and Ning -- as presently designed -- a problem that I have not seen any discussion of yet. Systems such as Google Base and Ning present an N-squared integration challenge to developers. Every app has to be potentially continually re-integrated with up to every other app in the worst case. But even in the best case, they present unworkable challenges to developers because every app may have to be continually re-integrated with at least a few other apps. Of course using ontologies isn't a magic bullet -- it simply pushes the problem to a higher level. If the ontologies are changed, then any apps that rely on them may break. But at least everyone can integrate their apps with one single ontology (or a few) instead of potentially millions of disparate schemas. From a developer standpoint this is a far more manageable problem. You can read more about my thoughts on the evolution of a World Wide Database (WWDB) here.